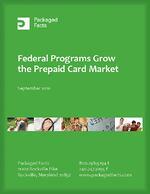 Read our FREE whitepaper to learn the impact of the federal government's use of prepaid cards on the market. Federal programs are growing the prepaid pie. The exclusive card that agencies have chosen to disburse program benefits. Fill out the form to the right to download your free whitepaper.